It’s Teaching Month here at PFF and we’re bringing you some in depth information from the PFF database on a whole host of subjects. Today we’re going to focus on blitz tendencies for defenses, and break down which teams bring pressure most often on a per-down basis on passing plays. Who likes to be aggressive? Who likes to play it safe? For reference, we at Pro Football Focus define a blitz as: any play in which the defense sends one more rusher than expected, based on the aligned down lineman or any time a defensive back rushes the passer. The Houston Texans batted injuries on defense as two key pass-rushers in J.J. Watt and Whitney Mercilus missed the vast majority of the season, leaving them short of pass-rushing options. When you look back at the 2016 season, they only blitzed on 35 percent of first down passes, and that was with Mercilus healthy, but Watt injured. Back in 2015, they blitzed on 33 percent of first down passes, so while they have always been fairly aggressive, the injuries on their defensive front likely played a part in dialling that up a bit in 2017. 2017 was also defensive coordinator Mike Vrabel’s only season in charge of the defense, so that aggression is something that the Tennessee Titans may indeed replicate in 2018. The most interesting team here is the Rams, who blitzed on 37 percent of first down passing plays despite having the most dominant interior pass-rusher in the NFL in Aaron Donald. Donald racked up 91 total pressures in the regular season and with the addition of Ndamukong Suh on the defensive line, along with Marcus Peters and Aqib Talib tightening up the cornerback position, don’t look for the Rams to be any less aggressive this coming season. Only five teams in the NFL blitzed less than 20 percent of the time on first down passes and when you look at the five teams that did, it’s easy to see why. The Cincinnati Bengals boast Geno Atkins, who led all 4-3 defensive tackles with 70 total pressures and a pass-rushing productivity rating of 11.8, while rookie Carl Lawson and veteran Carlos Dunlap combined for 131 combined sacks, hits and hurries off the edge. The Eagles saw Fletcher Cox and Brandon Graham combine for 111 sacks, hits and hurries in the regular season and had five players on their defensive line rack up at least 35 total pressures. The Chargers meanwhile, had the most dominant edge-rushing duo in the league with Joey Bosa and Melvin Ingram racking up 24 sacks, 23 hits and 104 hurries between them. Why didn’t these five teams blitz more? Because personnel wise, they really didn’t need to. 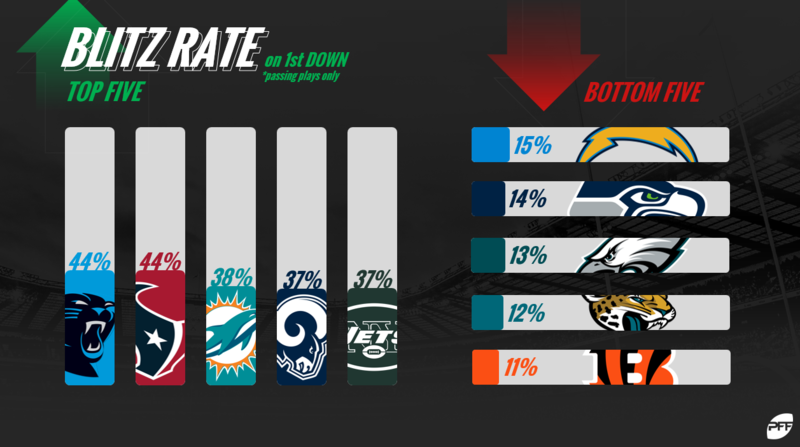 The Rams, Panthers and Jets were all among the most aggressive defenses on first and second down passes, while Cleveland and Tennessee join the top five for second down only. The Browns leading the way at 45 percent should surprise nobody, as defensive coordinator Gregg Williams has long been regarded as one of the heaviest blitzers in the NFL. With 2017 first overall draft pick Myles Garrett registering seven sacks, 11 hits and 19 hurries in his rookie season, how the Browns build around him going forward will be key. Regardless, don’t expect them to dial back on blitzing in 2018. 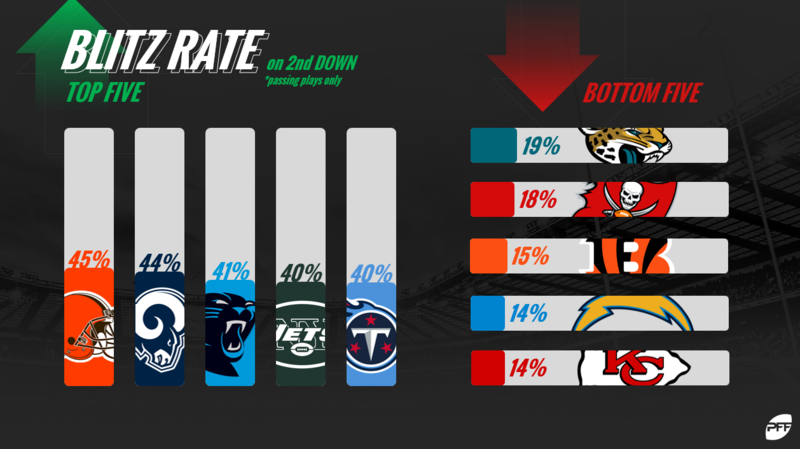 The Chargers, Bengals and Jaguars all remained under 20 percent on second down pass blitzes as well, and as we covered early, personnel wise they really don’t need to send extra pressure as they have enough talent to get to the quarterback without it. They are joined by the Chiefs, who were boosted by interior defender Chris Jones racking up 38 sacks, hits and hurries on the interior, and Justin Houston racking up 55 off the edge. The Tampa Bay Buccaneers didn’t blitz much on second down passing plays last season, and with a revamped lined that includes Jason Pierre-Paul arriving from the Giants after producing 54 total pressures in 2017, they may blitz even less in 2018. Gregg Williams take a bow! Only one team in the NFL blitzed on more than 50 percent of third down passing plas, and the Browns were also the only team to blitz on more than 60 percent as well. 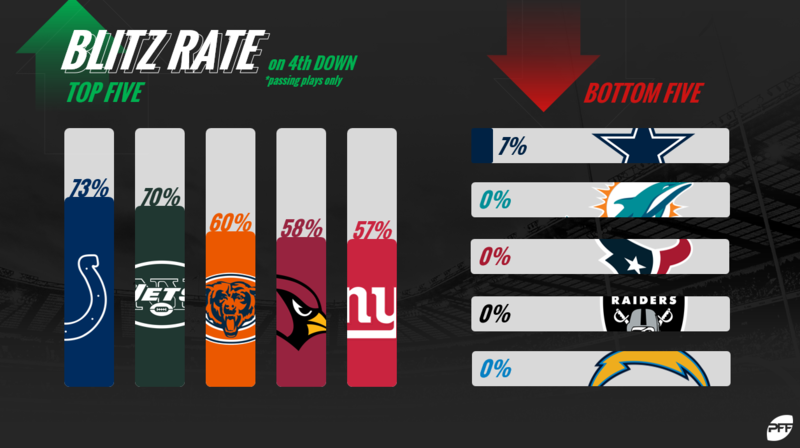 There are a multitude of factors that go into this and with the Browns being the underdog in most contests, it makes sense to increase variance where possible, but even so, it is still really something to see that they blitzed 13 percent more often than the next-most aggressive team on third down passes. After having five teams who blitzed under 20 percent of the time on first and second down pass plays, the Buccaneers are the only team in the league who blitzed fewer than once every five times on a third down passing play. 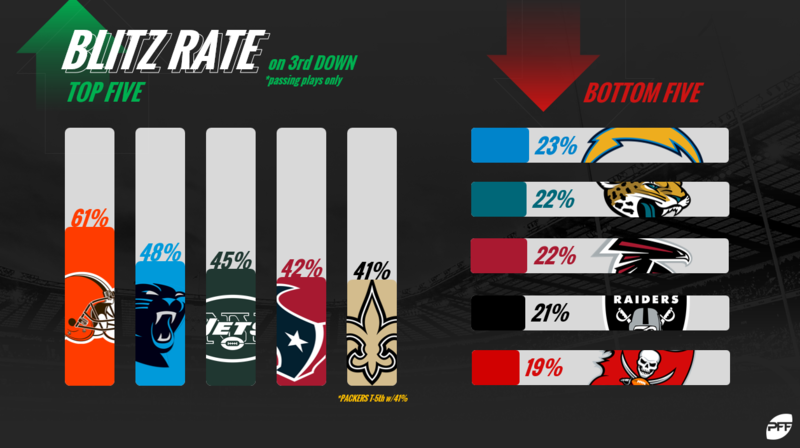 They only upped the aggression slightly from 18 to 19 percent from second to third down, while the Chargers still ranked in the bottom five, but upped their blitz percentage from 14 to 23 percent from second to third. It should go without saying, but obviously with much fewer offensive plays on fourth down compared to the previous three downs, sample sizes make these numbers a lot less stable and higher/lower than other downs. Still, it’s interesting to see that the Colts blitzed on eight of the 11 fourth-down passing plays they faced in 2017, while the Jets blitzed on 7-of-10. Sample size again plays a huge factor here, with the Dolphins, Texans and Raiders combining to see just 10 fourth down passing plays a season ago. The Chargers on the other hand saw 13, so even with a higher sample size, they were still confident enough in the duo of Bosa and Ingram to let them work their magic off the edge without trying to scheme pressure elsewhere.